We all have fails occasionally, but rarely does that happen with a pattern I've already sewn before! A month or so ago I made Simplicity 1317 with a slinky sweater knit. I added 2" for maternity wear and it worked out great. 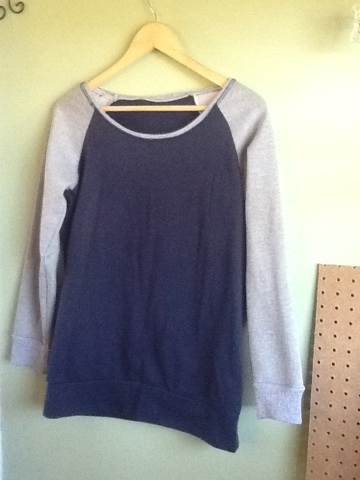 I decided to make another in sweatshirt fleece, which is what the pattern was designed for in the first place. I opted to color-block with grey and navy. The grey was from the remnants at Jo-Ann's, and the navy was from Girl Charlee. A few things went wrong. First, the grey had ZERO stretch. In general, I think it's just a poor quality. The navy from GC did have a small amount of stretch. Somehow I didn't notice the stretch issue until I'd already cut my pieces and tried attaching the neckband (in grey). The second problem was that I tried to lower the neckline. 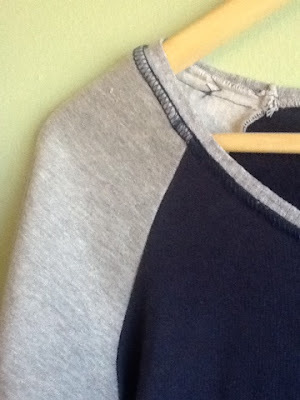 That, combined with using a no-stretch fleece for the neckline, totally f*ed it up. I cut it off and redid it with some ribbing cut from an old shirt. 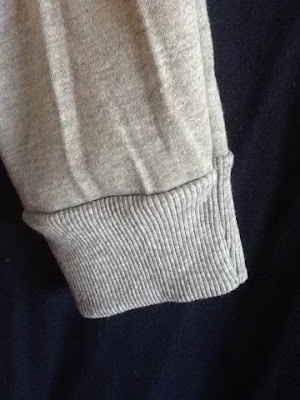 I also used that ribbing for the sleeve hems since the grey fleece wouldn't stretch enough. Sadly, the ribbing had no recovery. Fail #3. The only way to reasonably wear this sucker is with the neckline stretched WAY out, in an attempt to make it look purposeful and off the shoulder. 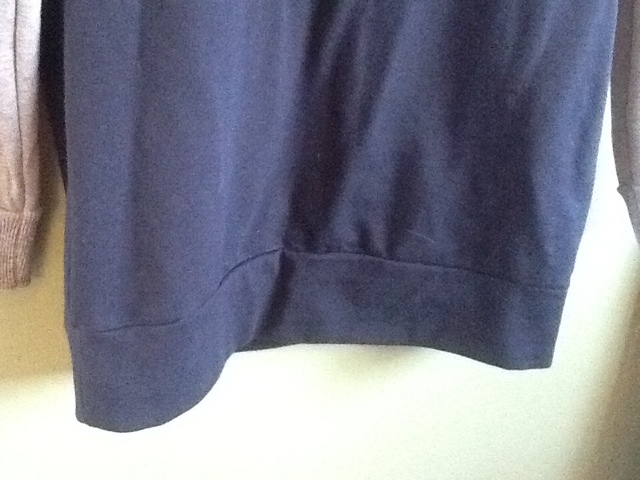 But the cuffs on the sleeves don't stay in place, so the entire garment feels awkward and annoying. And somehow the sleeves feel way shorter than my previous version. but it still looks bad. I tried wearing the sweatshirt and gave up after two hours. It was uncomfortable and not that warm. I'm pretty bummed because the navy fabric is nice, I wish I would have ordered enough to make a whole sweatshirt with it. The hem band barely stretches around my hips. This garment goes into a wad in the corner until I decide how to recut it for my daughter. And a word of warning: don't waste your time on the sweatshirt fleece at Jo-Ann's, unless your pattern requires no stretch and you have decent ribbing to go with it!